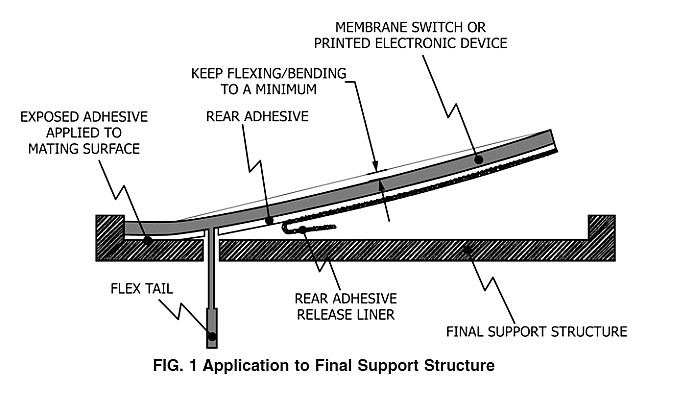 Note 1: Application to Final SupportStructure: Please follow ASTM Guide F3290 to prevent damage and failures. Section 6.2 of the standard is Application to Final Support Structure. 5.1 Membrane switches or printed electronic devices are tested for function and aesthetically inspected by the manufacturer before release to the end user. The user can unknowingly damage the device beyond repair prior to, or during, the application (laminating) process. 5.4 Component failure due to handling damage is one of the most common causes of customer complaints. It is the end user’s responsibility to ensure that the product is not damaged during installation.